Did this happen in Alabama? No. Idaho? No. Where in the world would Jews be forced to work on Yom Kippur? In a move that will most likely increase the boycott against AM:PM convenience stores and its affiliates, it has been learned the company compelled Jewish employees to work on Yom Kippur. The story was covered in the secular media as well, as there too, the move was condemned, with the explanation that Yom Kippur was until now an understood day on which the Jewish People refrained from work. Employees of AM:PM apparently were compelled to work for fear of losing their jobs as the stores continue to celebrate their total disregard for Shabbos and other Jewish holy days. According to secular media reports, in Tel Aviv, at least two AM:PM stores compelled Jews to work, stocking shelves and cleaning the store. They were paid 300% overtime for their efforts. Degel HaTorah MK Moshe Gafne turned to the Ministry of Industry & Trade, demanding the ministry use the full authority of the law against the company. Minister of Industry & Trade Eli Yishai (Shas) has ordered a full investigation into the incident. Over the past months, the AM:PM chain has opened three additional Tel Aviv stores on Shabbosim. 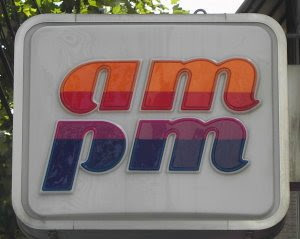 AM:PM is owned by the parent company as Shefa Shuk. YOU can make a difference. Boycott all AM:PM stores whether in America or Israel. See Rav Amnon Yitzchak Shlita! I dreamed a few nights ago and in it I was shown a large scorpion. I understood in the dream that that meant that Mashiach will arrive during the sign of the scorpion (Scorpio). I was then shown a building that didn't rest on earth, it rested on the ocean. I was shown a beautiful apartment that was huge inside and filled with clarity and beauty. The walls were lined with seforim and a Jew sat at a dining room table learning. I was to understand that this was NOT to be my apartment. I was then shown a very humble and mediocre apartment where I was to dwell. Then I was taken to an auditorium where all of Klal Yisrael was seated. We were all waiting for Mashiach to appear. The usher took me to the left side of the auditorium in the middle (not the front or the back). I wanted to sit up front but was not permitted. The Jews sitting in my row were talking sheker and divrei chol like some do on Shabbos in shul. I was very embarassed. 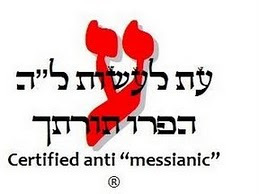 May Hashem reverse my gezeiros kashos and accept my teshuvah. May we strive to have the best in Olam Ha-Ba and not in Olam Ha-Zeh. Birkat Kohanim from the Kotel! New for Sukkot! What a fabulous turnout! May we ALL be in Yerushalayim: Kohanim, Leviim and B'nei Yisrael by Hoshana Rabba, greeting Mashiach Tzidkeinu! Despite the intermittently heavy rains, close to 10,000 people have showed up for the traditional Sukkot holiday march in Jerusalem. They set out from two different points outside the capital - the Kastel near Mevaseret Zion, and the Sataf brook not far from Hadassah Ein Karem Hospital - as well as from the Armon HaNetziv neighborhood in southern Jerusalem. All three spears will meet in Sacher Park near the Knesset, from where they will set out in the afternoon towards Liberty Bell Park. Very many downtown roads have been or will be closed in the city, adding pressure to the expected traditional holiday traffic jams. The list of closed streets reads like a Who's Who of Jewish history and culture, and includes Rabbi Akiva, Jabotinsky, Ramban (Nachmanides), Hillel, Shammai, Nathan Strauss, Ben-Yehuda, Ben-Tzvi, Betzalel, Shmuel HaNagid, Eliezer Mapu, Mendeleh Mocher Seforim, HaMatmid, Histadrut, Kakal (Jewish National Fund), Gaza, Shalom Aleichem, Achad HaAm, Keren HaYesod, HaAri, Saadiah Gaon, Benjamin MiTudela, and more. Among the marchers are or will be some 3,000 tourists from abroad who have arrived to show solidarity with Israel. Labor unions will also take part, including from Israel Aircraft Industries, government offices, banks, Israel Electric Company, the Postal Authority, and more. A relatively new arrangement is being instituted in Jerusalem, whereby motorists can park their cars for the day and receive bus tickets for travel around the city for only 15 shekels. The parking lots are located at or near the Supreme Court and downtown Safra Square. Free parking and bus rides begin at the Teddy Stadium and Ammunition Hill parking lots. Thousands more people are expected to descend on the capital for the various holiday activities, including the Hak'hel reenactment in the Old City at 4:30 PM. 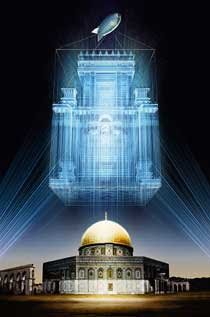 The event is sponsored by the Temple Institute and the Jewish Quarter Reconstruction and Development Company. It will feature public Torah readings by leading rabbis, the sounding of Holy Temple-type silver trumpets, a short film describing the Sukkkot water pouring festival, and the unveiling of the just-completed Kiyor HaNechoshet (brass laver), which the Temple Institute hopes will be used in the Holy Temple when it is rebuilt. An unprecedented 400 people were allowed onto the Temple Mount this morning, though only in separate groups, and the police allowed them - for the first time in memory - to read Biblical verses aloud. Another group is scheduled to visit Judaism's holiest site for 12:30 PM. All the visitors followed the precautions prescribed by those rabbis who allow ascent to the Temple Mount, including immersing in a mikveh (ritual bath), prior to and during their visit. Rabbi Chaim Richman of the Temple Institute explained the significance of the unveiling of the laver at this point in time: "The kiyor is the first thing used by the Priests in the Temple every morning, when they sanctify their hands and feet before beginning their daily service. Essentially, they are washing their hands of the misconceptions of G-d and of life that they had yesterday, and are beginning the new day with a new slate. The laver is thus all about looking forward. We ourselves must do the same thing; in this generation, we have to cleanse ourselves of mistaken conceptions regarding the Temple, such as that we need to stand by passively as it is brought down from Heaven. We must be proactive, constantly working, praying and thinking towards the rebuilding of the Temple and its restoration to its proper place as the central pillar of Jewish society." I have seen friends and family lose their homes, go off the derech, be diagnosed with major health problems like cancer. It seems everyone is suffering. My own healing of my broken leg is going much slower than expected. Were that these were our biggest problems! Why am I frightened? I am frightened becuase Mashiach Tzidkeinu is here and ready to reveal himself very soon. Oy lanu! We were warned for centuries! We were told to prepare! The Chofetz Chaim wrote that all Kohanim must learn the Avodah and be ready. We hold each of his precious words about Lashon HaRa as sacred, but when it comes to this... everyone disregarded it! I am trying to up my learning and trying to understand the complexities that I need to know... but how can I? I am an am ha-aretz. I am nothing. And I have no leader or teacher to help me. Who knows these intricate halachos? Who will step up and teach B'nei Aharon? I tremble with fear. The Melech sits in judgement and my merits are few. Oy lanu! I publically ask forgiveness of anyone I have hurt or offended and I forgive anyone who has ever hurt or offended me. May no person be punished on my account.